Yes J is for John. A .exe does sound ridiculous for a digital guide but I want the digital guide to be able to extract the graphics and data out of the rom. I don’t think a pdf can extract data from a rom. Ah, well to do something like that then yeah a PDF would be out, I had a different image in mind for when you said "digital 7th saga players guide". I still have a lot to think about with the digital guide. Who knows I may decide to just use a pdf. It’s a lot to think about and I don’t really have the time to work on the digital guide right now but it is something that I would eventually like to make even if the digital guide doesn’t actually load the data from a rom. New level data can be found in the rom at c0:ed00-c0:ee2b. Level up at 81-99 still needs to have a balanced level up value. and change ram address at 7e:1dc2 to 0x4e which is your current level. And also change 7e:1dd5-7e:1dd7 to 0xff, 0xff, 0xff which is your experience points. Doing this should get you up to level 99.
you all think would be the best option to fix this bug, fix #1 or fix #2? I'm leaning towards if damage is ever zero or less it should always be 1. I don't think there should ever be zero damage but I would like to here other peoples opinions on this. Besides the Encyclopedia of Adventure, what other merchandise was released for this game? I found a few interesting things! I can't recall how many ads exactly. But I'd say probably the EGMs, GamePros and whatever from late '93 probably. 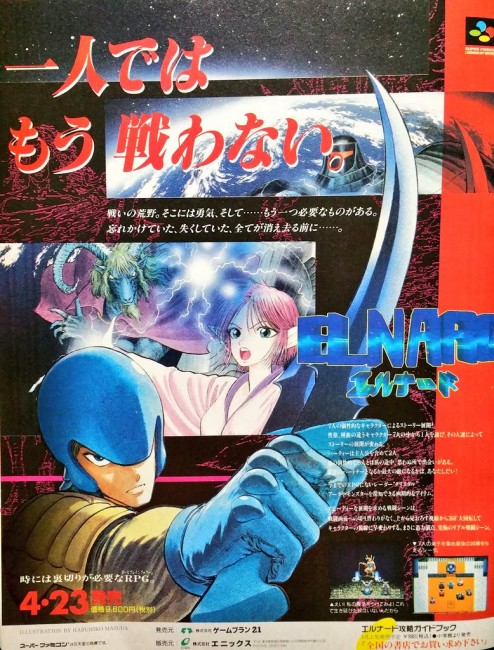 I know there is a site that has scans of old ("pre-2000") game magazines. But I don't think I can link to it. You could probably check there. 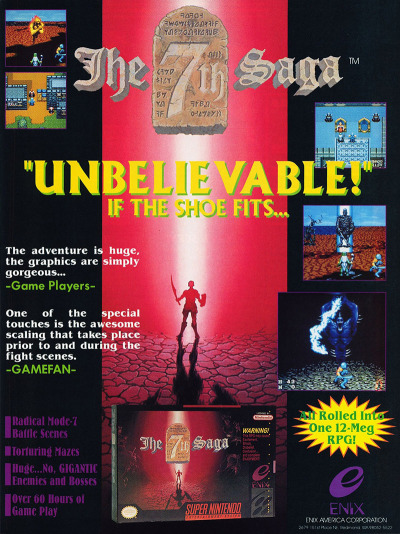 "Which magazines have 7th Saga ads" is a quite-specific criteria I don't think people have taken note of. Yeah the western release was ten times harder than the original Japanese version. So who do we ask on here about interest in starting a proper Elnard translation project? Also, I would love to see a ROM map, script dump, graphics dump of Elnard and Seventh Saga to compare differences. Scans and translated manuals/documentation would be nice too. I would start if I had the tools. Unfortunately I am not a programmer though. But I would be willing to help with other tasks. These are the 2 manga's and the encyclopedia of adventure guide book. This is another book but it is small around 18-20 pages and a phone card. I also have a 7th saga nintendo power card but I dont have a picture of it. I think I have seen 1 other ad somewhere but I cant remember where. There are Japanese guide books which use the American title? When you eventually start the translation project, would you be using the orignal Japanese ROM? (sorry for the dumb question). I just like the idea of a purist translation if at all possible. Its interesting reading the Japanese Wiki page on Elnard using Google Translate. Seems like the game definitely had a religious theme going on. I can definitely hear his style. Pretty damn cool! The 2 mangas comics, yea, that’s strange. I have no idea why they would use the American title for them and not the Japanese title. Yes, I will use the original elnard for the translation. Not really sure which other one I would use. 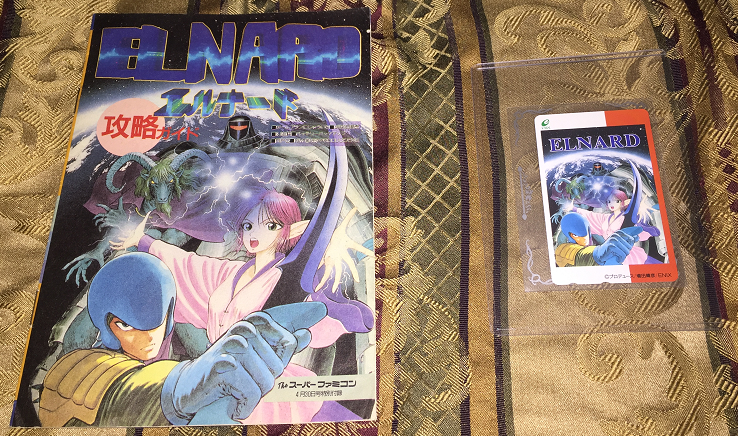 I definitely won’t take any 7th saga scripts and incert them into elnard to make the English translation. The actual Japanese would be translated to English. The starboy91 blog was a good read. I learned some new things. I tried to post on that blog but it wouldn’t let me. I would like to know how to reproduce the bug starboy91 talked about in 7th saga when you talk to a npc in a town then talk to another npc in the same town and they say the same thing. starboy91 said that doesn’t happen in elnard only 7th saga. I never knew one of the images(lower left of the 4 images) on the back of 7th saga box was from elnard and not 7th saga. Now I might have to make a new box image. I didn't know so much things were changed for the US release besides the difficulty raise. Now I really hope to see a retranslation. While you're working Elnard, I would kind of like to see a patch with the 7th Saga script inserted just as a secondary patch. If that's something you've figured out enough about the game to easily do it. Just as I've heard existing "restoration" patches weren't quite correct. Well, without that feature in the US version that makes you watch the title screen every time. That's like 20 seconds wasted. But maybe it's only a huge annoyance when you're save-scumming the Seeds, which maybe you wouldn't need to do without the crazy difficulty. Hey guys did you know 7th Saga is licensed by Nintendo? but the difference in difficulty is one of the main reasons why I want to translat it. I just don’t think I’m going to like the difficultly in elnard. I really liked how hard 7th saga was and when I make a hack of 7th saga it’s going to be way harder than 7th saga. It might sound crazy to make 7th saga harder but my hack is going to add so many new features that are currently not in the the game to add strategy to defeat enemies so it would not make it as repetitive as defend attack or relying on the ruins. Two things that I plan on doing to make 7th saga a little harder is adding active battles like in final fantasy and remove mode 7 from battles. The mode 7 is cool in battles but it is not worth it to have it. The game can easily be so much better with out it. In mystic arc(7th saga 2) there is no mode 7 in battles and all of the enemies are on a background layer and your characters and spells are on the sprite layer, in 7th saga all enemies, your characters and spells are on the sprite layer so that really limits what you can do. If I remove mode 7, battle backgrounds would look better, I could easily double the different amount of enemies in battle, and I think I can add a extra character in battle. I really don’t think it will be to hard to remove mode 7 because 7th sagas enemy/character sprite layer data is formatted the exact same way as mystic arcs enemy background data. You can literally copy and paste 7th saga enemy data to mystic arcs enemy data and vice versa. So yea I think that would do wonders for improving 7th saga. Lol, I guess I got a little carried away with my post be hey, 7th saga is the reason why I signed up for this stuff. Yea, I could also do a patch with the 7th saga scripts as a secondary patch. It’s probably going to be awhile before I get to translating elnard because I have a lot of other things in the works right now but hopefully by the end of the year I could slowly start working on it. go ahead and upload it and my other recent patches with the source code for each patch. I really need to start uploading all of my patches for 7th saga so they don’t get lost by a hard drive crash or something else. So this is a petty detail that probably only matters to me, but I've always found it distracting how some of the player characters seem to have overly jagged shadows. Since slidelljohn was kind enough to share that deccompressor patch a while back, I went ahead and smoothed/simplified the shadows. All the PC shadows have been tweaked, though the changes are most noticeable on Kamil and Esuna. I also touched up Lejes' horns to make him more closely resemble his appearance in the Japanese game, though I left his newer palette intact. It's also worth noting that this appears to work fine with Nati's "The New Class" re-balancing hack, though since that hack adds a header, it has to be removed prior to applying this or the decompressor. These look really good! What about the other characters? I could compress these for you with 7th saga’s compression algorithm if you want me to. Since there is a few less pixels in the graphics, the compression size might be a little smaller than the original. Even though my decompression patch works I still need to make some changes to it. What changes are you planning for your updated decompression patch? I haven't run into any bugs thus far, even when combined with "The New Class." Also really looking forward to your completed Gradius 3 hack! Some of those jagged shadows do make sense for some characters though, Lejes and his ear things (what are those?) plus his ragged cloak, and Wilme's horns, etc. Esuna and Kamil do seem a bit weird though too. Also I'm glad to hear you like 7th Saga hard, that's what makes this game so great, now I don't have to worry that slidelljohn might turn into a baby mode version. The only part that needs fixing balance wise is a certain apprentice fight, just how it can scale out of hand end game wise. I think it’s worth posting the patch. I think a patch with my updated decompression patch(hopefully I’ll get it completed this summer) and another one with the graphics compressed. It is a minor sprite hack but imagine the options we could have if we had a lot of minor hacks like this whether it’s sprites or asm. If you did officially release it I recommend including the source code with it as well. The last few patches that I posted for 7th saga I’m going to officially post on here with the source and my updated decompression patch will be posted with the source as well. I think including source is really important for the future rom hackers who want to learn something new and develop their skills. Did you look at any of the NPC’s and enemies to see if they are worth editing? What other touch ups have you done? Whenever I get my tools and patches completed for the games that I want to modify I’m going to need a lot of sprite and background work done for 7th saga, mmx, and gradius 3. I can do some sprite work but I’m definitely no artist. The sprite work that I like to do is like a chop shop. I like taking parts of different sprites mixing them up and slightly edit them to create something new. I can’t really create anything from scratch. Besides my 8-9 year old incompleted profile image here is some chop shop work I did for mmx. 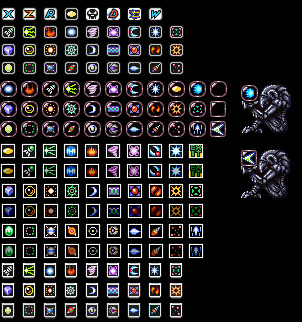 Those are my for my number life point sprites and some sprites that I am considering for my sa-1, 128kb vram hack that I plan on making for mmx. The rest of the sprites are original but I’m missing a few of those. The statue is there just to show where I got the round bubble from. The round bubble was created by me from the square bubble. The only thing I’m not really happy with these new edited sprites is that zero’s sprite for his numbered life points. I tried but I just couldn’t get it to look good. That was the best I could do. Maybe I should make it similar style to x’s icon but as a all red Z. The decompression hack needs the code to be cleaned up and I may need to do some slight editing to the code because there was a work around that I had to do for romuses ai death assembly code. I also may have missed some pointers to some graphics that I could have missed. I’ll find out if I missed some pointers when I finish fully disassembling 7th sagas asm and data. I’m not sure but I think I may have left the compressed graphics in the rom so if they are still there they need to be removed. The gradius 3 work that I have done was just so I can learn how to implement fastrom and sa-1 but I am really looking forward to playing it with my added difficulties with no slowdowns. I’m glad there are a couple of people helping with it. Lol, they are horns for a demon. 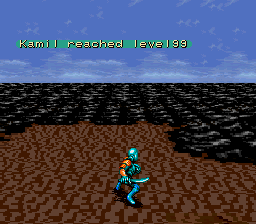 When I eventually get to making a full 7th saga rom hack I’m going to increase the difficulty for the player by using more strategy to win battles than by level grinding. A lot of the game needs work but it has a good foundation and potential to be a really good rpg for the snes. I already think it’s a good rpg and it’s one of the games that I like the most on the snes but it does have lots of flaws. I’m really hoping that after I get all of my hacking tools and modifications done to 7th saga that I can get a team of people together to help remake the game into something really special. My 128kb vram mod that I’m also making for it should help do wonders for new backgrounds. Hopefully I can find some talented artists to make new backgrounds and sprites for it.